A weekly newspaper invited four local artists to redesign its masthead to celebrate a forthcoming festival. 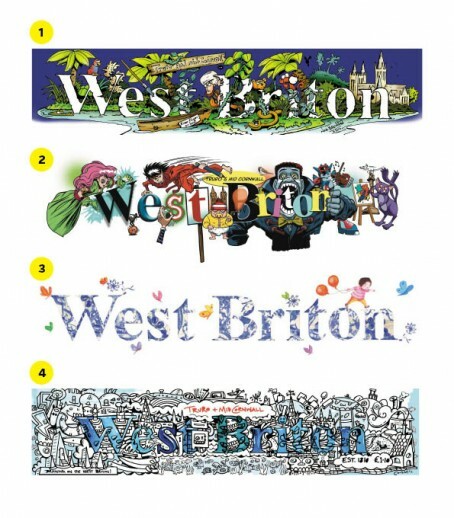 The West Briton commissioned the designs to mark the Truro Festival which takes place this week. The four artists each recreated masthead in their own style and readers are now being given a chance to vote for their favourite. The winner is set to be used on this week’s festival edition of the paper which is due out on Thursday. Editor Jacqui Walls said: “This has been a really exciting project, working with four fantastic Cornwall artists, and we can’t wait to see them in print. The four artists were cartoonist Nick Brennan, illustrator Keith Sparrow, children’s book illustrator Caroline Pedler and street artist Cosmic. Crazy. Can you imagine M&S or BT allowing such messing with their corporate brand? Thought not. This will do nothing for sales of the paper and thus is just wasted effort. I sometimes wonder if stunts such as these are done less for the reader and more to allow editors to make some noise on company intranets and HTFP. Michael Mount – do you ever use Google on these interwebs? I expect this will probably lead to more copies of the paper being printed and sold, more trees being felled, squirrels made homeless etc. And, a warm fuzzy glow among artists, readers and advertisers.